One of my favorite desserts during the spring and summer is cake served with fresh fruit on top. Because of this I have tried quite a few pound and angel food cakes over the years. I have found several really good recipes. But recently I found one the was very interesting. It is a cold oven pound cake. These were popular years ago to save money by not preheating the oven. I guess they were quite popular at one time. This cake takes quite a bit longer than your normal pound cake to bake, so I am not sure you are really saving money by using less electricity or gas. But either way it is really good. This cake was quite light, for a pound cake. I was surprised. I really did not know what to expect from this recipe. But it was really good. 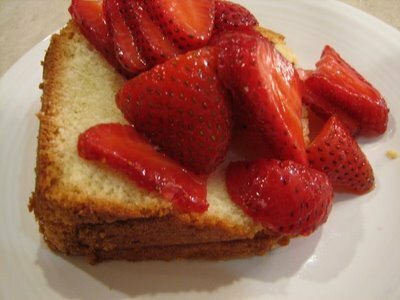 It was one of the best pound cakes I have made and I will make it again. Have you ever heard of Cold Oven Pound Cake? You’ll need a 16-cup tube pan or angel food cake pan for this recipe; if not using a nonstick pan, make sure to thoroughly grease a traditional pan. Adjust oven rack to lower-middle position. Grease and flour 16-cup tube pan. Combine flour, baking powder, and salt in bowl. Whisk milk and vanilla in measuring cup. With electric mixer on medium speed, beat butter and sugar until fluffy, about 2 minutes. Beat in eggs, one at a time, until combined. Reduce speed to low and add flour mixture in 3 additions, alternating with 2 additions of milk mixture. Mix on low until smooth, about 30 seconds. Use rubber spatula to give batter final stir. Pour batter into prepared pan and smooth top. Place cake in cold oven. Adjust oven temperature to 325 degrees and bake, without opening oven door, until cake is golden brown and toothpick inserted in center comes out clean, 65 to 80 minutes. This took 85 minutes in my oven, so it may take longer in yours also. Looks wonderful! A true summers dessert. I have heard of this but I never made it. Great for the summer fruits. I love pound cake, sponge cake etc. What an easy recipe this is. Love the pound cake!! Thanks for a new recipe to try. This looks perfect for summer. I’m going to try it next weekend. Thanks! Do you use brown rice flour in the cold oven pound cake? This is a recipe from before I went gluten free, so the recipe calls for regular flour. I have not tried this in gluten free yet.